I updated my linear regression between OECD oil inventories and WTI crude oil prices for the period 2010 through 2018. As expected, there are periods where the price deviates greatly from the regression model. But overall, the model provides a reasonably high r-square result of 80 percent. 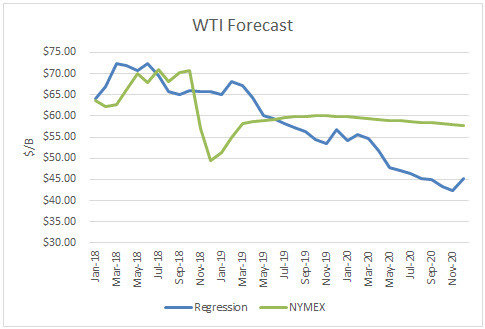 I used the model to assess WTI oil prices for the EIA forecast period through 2019 and 2020 and compared the regression equation forecast to actual NYMEX futures prices as of March 14th. 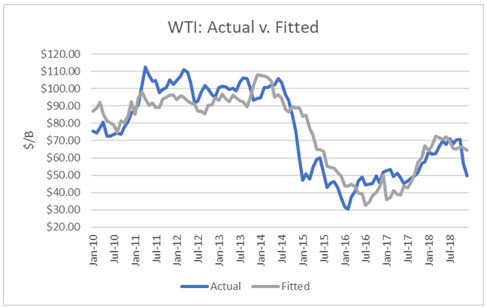 The result is that oil futures prices are presently undervalued until June 2019. From July 2019 and beyond, they are overvalued. In the latter part of 2019, oil prices would drop again below $55 if these inventories are realized. By late-2020, oil prices would drop below $45. Based purely on this model, the oil price crash in the fourth quarter was overdone. However, the market was shocked by the sudden oversupply since it was expecting an undersupply once sanctions went into effect, but Trump granted waivers. 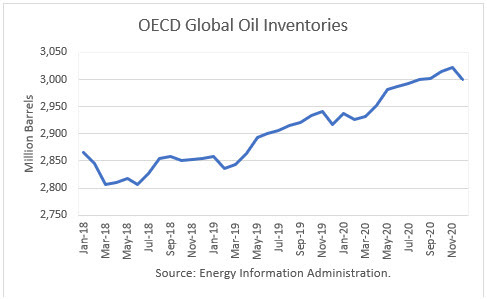 Following the draw in February, OECD oil inventories are projected to build again through 2019. That, in addition to uncertainties around Venezuela and Iran, could keep prices could exceed $60s in the months ahead. However, the NOPEC legislation – No Oil Producing and Exporting Cartels Act – in the U.S. Congress is progressing. The House Judiciary Committee approved the bill, and it will be considered by the full House. There is bipartisan support. Suhail Mohammed Al Mazrouei, the United Arab Emirates oil minister and the former president of OPEC, told a group of U.S. financiers Monday that "if the so-called NOPEC bill becomes law, the cartel would stop working and therefore every member would raise production to maximum capacity, causing a crash in oil prices, according to people who attended the meeting". OPEC General Secretary Barkindo has said, "it is not in the best interest of the United States to enact NOPEC". U.S. Energy Secretary Perry has said, that he "wants to see oil prices remain stable". At present, market conditions are too risky for me to favor either side of the market compellingly. I will wait for a better opportunity.